I’m so intermittent with the Abbey Girls that it always takes me a moment to orientate myself and figure out where I am in the series. Is Maidlin old or young? Is Joy a muppet or vaguely appealing? Is Mary Dorothy around and just which cook called Anne is it? Has Rosamund had her ‘fifteen children within two weeks’ yet? Having orientated my way through that period of adjustment, I then always find the Abbey books a little – saturated. I’m not sure that’s the best way to describe them, and I’m very certainly not meaning that they’re damp, so let me try to explain what I mean. Perhaps another word will show itself as I do so. My heart belongs with the raw edge of the Chalet School, that moment where it could be searing or hideous; the unfinished moment of books that teeter wildly on the edge of brilliance or fall into utter tedium. There’s not much of an in between in Brent-Dyer’s world; these books are wonderful and they are lovely or they are Althea. The Abbey books don’t have that unfinished edge for me. They’re rounder, and glossier, but they don’t have that sense of trepidation. That nervous unknown edge of what might lie behind the corner. That’s what I mean by saturated; it’s all too bright, too colourful. It’s a world without fear, without edge. Maybe that’s because of the books I’ve read, and the way I’ve read them. Journey toward literature often means as much as the literature itself. But then, here I am recommending a book that makes my theoretical side twitch, that makes all of that that I have spoken about come forth, here I am giving it five stars and here I am about to rave about the very things I have marked out as problems. Maid of the Abbey is lovely. It’s gorgeous. If it were a Friends episode, it would be The One Where Maidlin Gets Married Off And Everything Is Perfect. Oxenham has this great unease with letting her gifted and talented characters exist in isolation (something I wrote about, slightly rubbishly, aeons ago here). Marriage is the ultimate goal, in this world defined by women and inter-female relationships, and it makes me itch but I don’t care here, because this book is lovely. Oxenham writes with just a wildly entrancing verve; this is a thick slice of cake and slippers by the fire sort of a book. It’s just good, comforting, warm literature. I loved it. I really did. And I think Maid Of The Abbey shows that skill at its best; Maidlin is married off, yes, and we all fawn around Joy for reasons I am yet to figure out, but we do all of this because the writing is so convinced that this is the best thing for these characters. Authorial drive. Love, really. And to go against that, to stand up against that sheer tide of certainty and rich, delicious, writing – I can’t. Not now. Not today. The title influences us before we have even reached the central text of the narrative. The new girl is a Genius (capitalisation most intentional). She is identified primarily by her function. We read her as a genius before we read her as Nina. Poor Nina. She’s screwed before she’s even begun. This is the moment where a Genius at the Chalet School becomes really interesting for me. This is big stuff. The parallels between genius and madness are palpable. The ‘narrow focus’ of genius propels the bearer towards a less than fulfilling existence. And, it cannot be escaped, that this fulfilled existence conceptualised by Joey does include love and therefore, marriage. Through using Joey to provide the dominant ideological point of view regarding genius, Brent-Dyer is imbuing her with an authority that is very much absent from any other character in the series. Joey plays a specific and unique role in the Chalet School series. From acting as the school’s first pupil, she never quite releases her ties with the school and ultimately acts as an embodiment of the Chalet School both physically and psychologically. What Joey says is accepted as truth. It is the nearest we get to direct authorial intervention in the text. But then, what do we make of musical Margia Stevens? Bright, bold and brilliant Margia who remains, as far as I can tell, a musician and single and not particularly lopsided? Are there levels of genius in the Chalet School and are Margia and Jacynth Hardy (sad shy Jacynth!) fated to never achieve the greatness of Nina? It’s interesting to note that both of these other musical virtuoso’s are very deliberately never presented as geniuses. Margia, commonly accepted as one of the more brilliant of Brent-Dyer’s creations, remained a highly-talented individual and yet distinctly removed from genius. She has a “mania”, a “passion”. But she does not have overt Genius (and if she does, it’s been cut out of the pb texts which are my primary references). It’s perhaps notable that Nina, in a cast of eventual-thousands, is unique in her extreme creativity. The school story does not react well to difference. The Chalet School in particular takes overt pleasure in creating ‘the Real Chalet School Girl’ model of behaviour and, as a direct consequence of this, ‘genius’ cannot easily thrive in such a context. It’s perhaps why we see so few many of the Chalet Girls engage in extreme creativity, despite a lot of them having obvious proclivities towards such an aim (Amy and her poetry, Samaris and her flute etc). 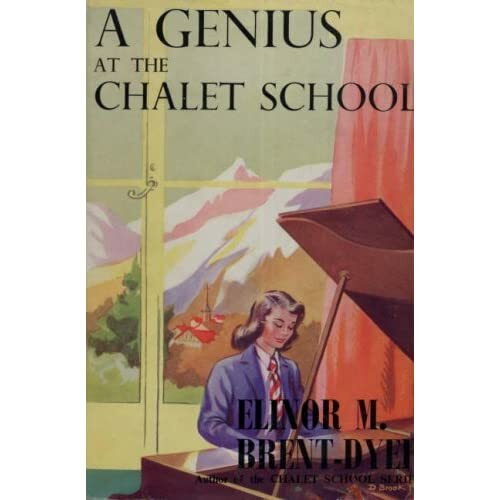 And it’s why, despite being one of the perhaps most overtly linear books to read (new girl comes to school, gets a grip, turns into good egg), I find A Genius at the Chalet School really rather remarkable. Elsie Oxenham (EJO) and the Abbey books is one of those series I fell towards following my love-affair with Brent-Dyer. EJO is an odd writer; one who’s dated greatly and then, in some queer little moments, not at all. I’m reading my Abbey books at present with a view towards gaining research for my dissertation – Representations of Gifted and Talented Children in Children’s Literature. Unfortunately I don’t have many EJO and those that I do need a roadmap in between them to figure out what’s happening. What with Joy and Joan and Jen to start off with and then there’s Rosamund, Rosalin, Rosabel and then there’s adults and babies and marriages and deaths and it’s a bit of hard work to figure out what’s going on at times! But there’s a curious charm in these books and a very feminine feel to them. The few men that do appear either die or disappear swiftly, leaving the Abbey girls to form their supportive sisterhood without them. And it is a sisterhood. It’s a fascinating – and quite beautiful – example of how women support women and also – when Joy puts her foot in it – how women can bring each other down and then build each other up. The books, at their heart, are about love and how it can sustain a community through thick and thin. And yet, EJO doesn’t hesitate to marry off her characters. Marriage is the natural evolution for them. Mary Damayris, a powerful and beautiful ballet dancer, leaves the stage for love in A Dancer from the Abbey. It’s interesting how clearly this is presented throughout the book. It’s a natural evolution for her. She leaves and her dancing becomes better because of her love. There’s a pull between the stage and her husband-to-be, explored briefly and then dispelled as the cast accept that love will make her dancing better and stronger. It’s clear though that she’s now a wife first and a dancer second. A similar thing happens with Maidlin. Again, this is based on limited exposure to the books, she is a tempestuousItalianate artistic child with a beautiful singing voice and then she turns into just another run of the mill adult. I can’t tell you how much this made me wince upon first reading – the appealingly complex and frankly unusual child falls into a clichéd mother and adult. I’m looking at getting a copy of a few more EJO titles in the near future and will be deeply intrigued to learn if this is just a misconception of mine or whether my feelings of disappointment continue. So is this it in the Abbey series? Is talent a childish thing? Is a gift given up when a husband appears on the scene? Is a gift a gift and never your own talent? Do you have to give it back when marriage calls? Does marriage conquer all?